Mansour Ourasanah has created the Lepsis, an attractive insect breeder that could be used to grow grasshoppers in an urban home. Should you be including (more) insects in your diet? Ourasanah collaborated with KitchenAid to develop the Lepsis, a small, decorative unit that can rest on a kitchen counter. The unit addresses the question of how to produce large amounts of protein without devoting more land space to the cultivation of insects, and it was just announced as a finalist in the INDEX awards. According to Ourasanah, 80 percent of the world population already eats insects, and introducing edible bugs to rapidly-expanding urban populations could significantly reduce the impact of meat production on the environment. 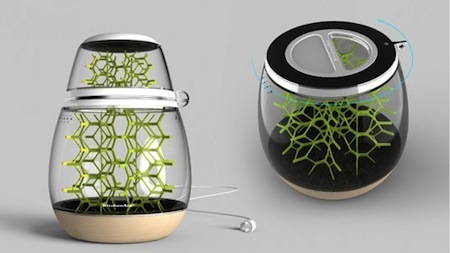 The Lepsis is a vessel that can be used to grow insects for food. The product consists of four individual units that are each designed to breed, grow, harvest and kill grasshoppers, and they combine to form a decorative kitchen product. “In order to move toward a sustainable future, we must do away with our culinary hangups and redefine the paradigm of food,” explains Ourasanah. ...I balked when my wife served me termites. Thanks to Eric for the tip and the quote; via Inhabitat.